Listen and read along as Pastor Chuck tells the greatest story ever told: the story of God’s love. Hear about the problem so big that God had to come down and fix it for us Himself. Follow along with the friends and disciples of Jesus as they see God’s plan unfolding. Step into the empty tomb and discover what Jesus left there. And rejoice at the promise this story gives us all: The Story of the Resurrection. 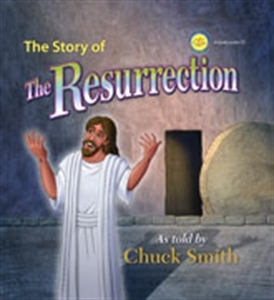 As a gift, each book contains an audio CD of Pastor Chuck reading the story of the resurrection and features the voice talents of Skip Heitzig, Greg Laurie, Raul Ries, Cheryl Brodersen ... and many more! It’s never too early to start reading to your children timeless Bible stories taught by Pastor Chuck. Imprint God’s Word upon their little hearts as you read this story over and over again.